When I think of chicory, two dishes from my childhood instantly pop into my mind: chicory salad with apples and walnuts and baked chicory with ham in a béchamel sauce. As a child, I used to find raw chicory much too bitter, but I absolutely loved it baked – that is because once it is baked, the vegetable loses its bitterness and takes on a moorish buttery flavour. 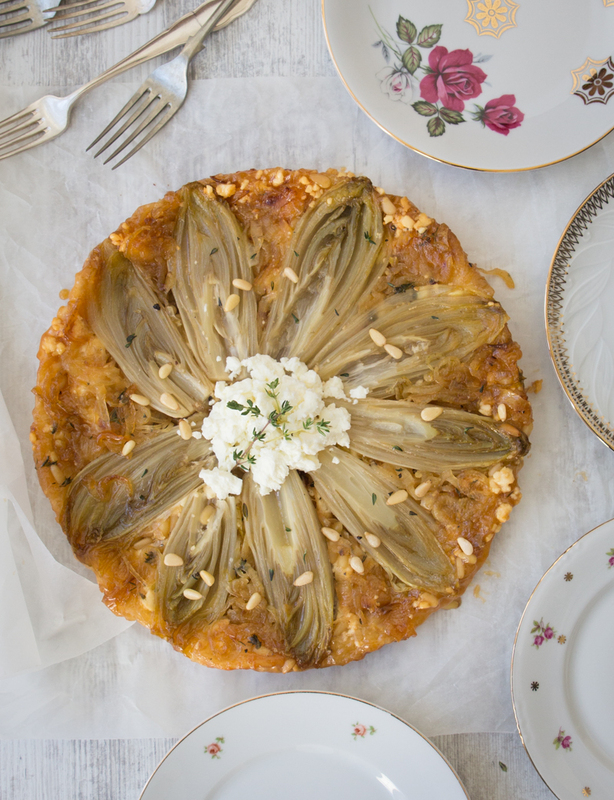 Chicory is also beautiful paired with sweet ingredients: in this recipe I am pairing caramelized chicory with salty feta in a flaky puff pastry. A stunning veggie main! You can watch me make this Tarte Tatin here. 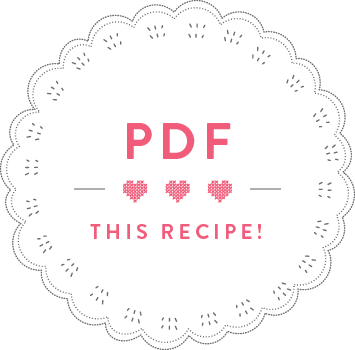 If you want to read the recipe in Luxembourgish, click here. Peel the onions and cut into thin slices. Melt half of the butter in a frying pan and gently fry the onion slices with a pinch of salt for about 10 minutes until really soft. While the onions are frying, slice open the chicory heads lengthwise, trim off the bottoms and cut out the inner, triangular core – this is the bitter part of the chicory. Set aside. Pull the thyme leaves off the sprigs and set aside. After 10 minutes, add 1 tablespoon of sugar and fry for another 5 minutes. Remove the fried onions from the pan and set aside. Put the remaining sugar into the frying pan used for the onions. Leave to melt over a medium heat, swirling the pan from time to time, but without stirring the sugar. Once the sugar starts to get a golden hue, add the remaining 40g of butter. Stir the caramel with a wooden spoon until you get a smooth caramel*. Pour the caramel into a 30cm quiche tin, add a pinch of salt, the thyme leaves and the pine nuts. Place the chicory halves cut-side down on the caramel. Scatter the onions over the chicory heads and crumble three quarters of the feta on the top. Cover the chicory heads with the puff pastry, tucking in the edges on the side and pricking the pastry with a fork in a few places. Once baked, take the tarte tatin out of the oven, turn onto a serving platter, sprinkle with the remaining feta and season with salt and pepper.